Dowst’s Systematic Master Win Method!! + The ‘Phantom’ Progression Method FREE!! 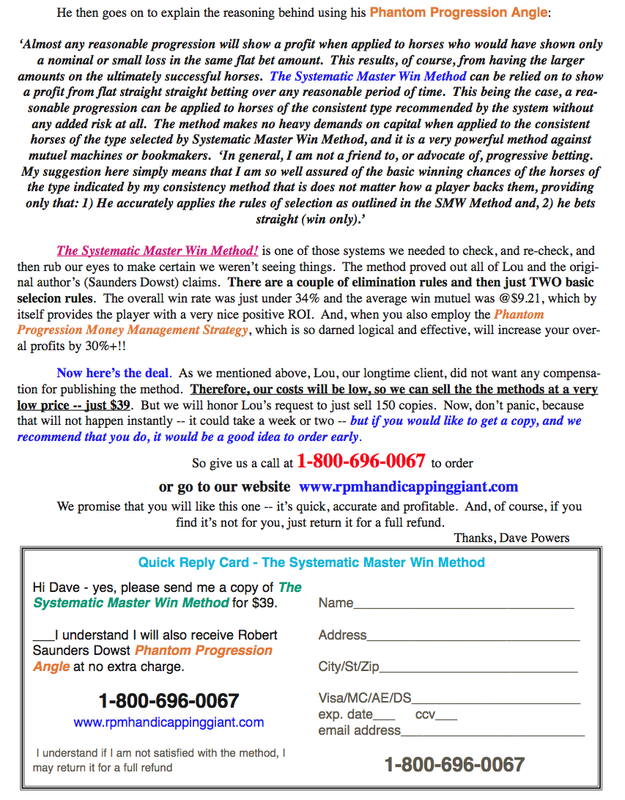 The Systematic Master Win Method!! 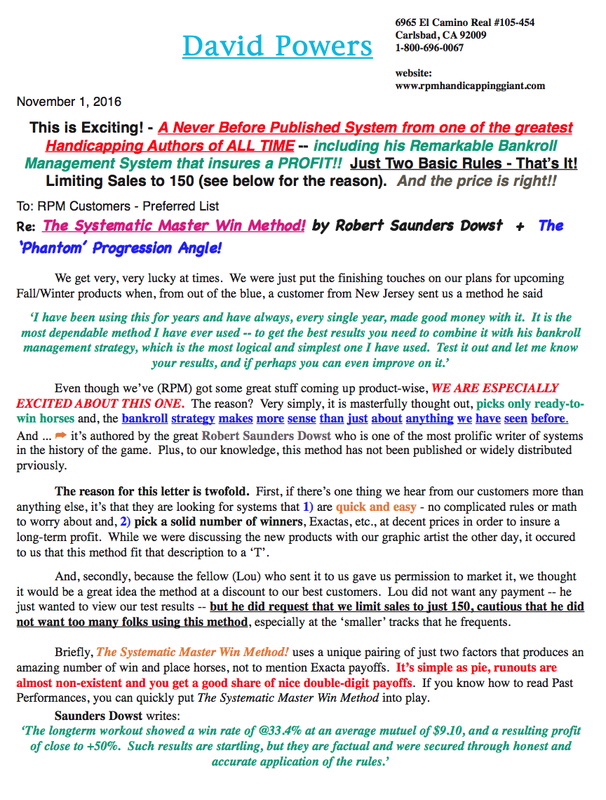 Includes The Phantom Progression Bankroll Management Angle FREE!!! Paper & Pencil, Ebook & Software Versions Available! SMW Exacta Key Box – the suggested Exacta box or key based on the System rules. 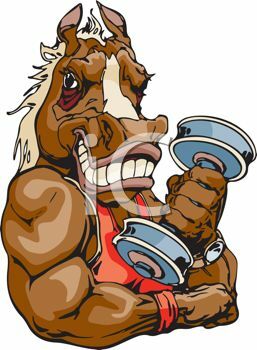 Overall, we have found that ‘keying’ the first horse listed works best. By ‘keying’ we mean using the first listed horse in boxes with the other horses. So in the above example, we would have three Exacta boxes — a 9-6 box, a 9-1 box and a 9-3 box. You can also do a 4-horse box using these horses, but we would suggest that only in races where there are 8 or more horses entered. 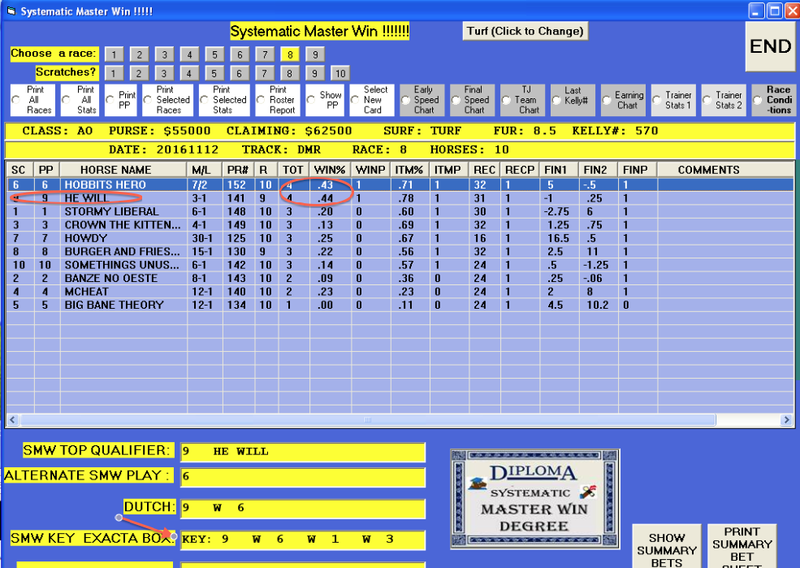 The Systematic Master Win System is based on betting only on horses who show a consistent win and in the money record. The ideal play is a horse who has won close to 1/3 of his races and finished in the money close to half of the time. In the software version we have allowed the program to also highlight horses who may fall short on the win end but still has a 50%+ in the money record. These horses usually run well and should be included in your exacta, trifecta, superfecta plans. In situations where the SMW Top Qualifier has a total of 4 in the TOT column (the maximum) and no other horse has more than 2 in that column, the Top Qualifier is a very strong win/place candidate. This is especially true in sprint races for races for males. In cases where several horses are tied with 3 points that race should be approached with caution. This suggests that the race is wide open.